Youtube is a great service minus the fact that you cannot download the videos (damn copyright laws). This problem was once fixed with a Firefox plugin, but the plugin downloaded the files into a .flv extension file which would then have to be converted into another more usable video format. 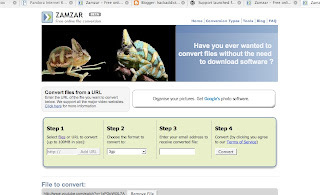 "The Zamzar web browser button is a link you can add to your web browser's "Bookmarks Toolbar". You can use it to convert files from all your favourite websites at the click of a button." When you click "Convert with Zamar" the link to takes you from the page you're on to the Zamzar site. From there it asks you what format you would like to convert your file to and your email address. Once you input your information it starts to convert the file. When the file is done it will email you a link to a downloadable file that will expire after 24 hrs. I have a mac and confirm that it works in the Intel build of Firefox. The plugin is great: it's super easy to install and does exactly what it says.